Mannerfelt syndrome refers to rupture of the flexor pollicis longus (FPL) tendon from attrition caused by a bony spur in the carpal tunnel. Such ruptures were described by multiple authors from 1891 on. [1, 2, 3, 4, 5, 6] In 1969, Mannerfelt published his series of attrition flexor tendon ruptures in rheumatoid arthritis (RA) caused by bony spurs in the carpal tunnel. The FPL tendon was the flexor tendon most commonly ruptured in this setting; consequently, this specific lesion was named after Mannerfelt. The FPL originates from the middle of the anterior surface of the radial shaft, the adjoining part of the interosseous membrane, and the coronoid process. It is the most radial tendon in the carpal tunnel. The tendon passes under the transverse carpal ligament and around the hook of the distal scaphoid, and it inserts into the base of the distal phalanx of the thumb, flexing the distal phalanx. The anterior interosseous branch of the median nerve supplies the FPL. The muscle receives its blood supply from radial artery muscle perforators. Within the tendon sheath of the thumb are two distinct vincula. Feeding vessels to the trapezium and scaphoid are present on the volar radial aspect of the trapezioscaphoid joint. These vessels course along the trapezioscaphoid ligaments to reach the scaphoid tuberosity. In rheumatoid arthritis (RA), according to Mannerfelt, the intercarpal ligaments lose strength, and the carpal flexors exert a continuous pull, causing volar subluxation of the carpal bones. Destructive rheumatoid inflammatory tissue follows the feeding vessels, causing erosions at the distal volar scaphoid and the proximal volar trapezium. Bony tissue between the erosions forms sharp spurs that cut through the weakened carpal tunnel floor and can lead to attrition of flexor tendons (see the image below). Mannerfelt syndrome. Edges of ruptured flexor pollicis longus tendon can be seen. Bony spur is present at floor of carpal tunnel. Von Zander W. Trommerlahmung. Berlin: Faculty of Medicine; 1891. JAMES JI. A case of rupture of flexor tendons secondary to Kienböck's disease. J Bone Joint Surg Br. 1949 Nov. 31B (4):521-3, illust. [Medline]. LAINE VA, VAINIO KJ. Spontaneous ruptures of tendons in rheumatoid arthritis. Acta Orthop Scand. 1955. 24 (3):250-7. [Medline]. LINSCHEID RL, LIPSCOMB PR. Advances in surgical treatment of the rheumatoid hand. Minn Med. 1962 Mar. 45:273-7. [Medline]. FOWLER SB. THE HAND IN RHEUMATOID ARTHRITIS. Am Surg. 1963 Jun. 29:403-4. [Medline]. LIPSCOMB PR. SURGERY OF THE ARTHRITIC HAND: STERLING BUNNELL MEMORIAL LECTURE. Mayo Clin Proc. 1965 Feb. 40:132-64. [Medline]. Mannerfelt L, Norman O. Attrition ruptures of flexor tendons in rheumatoid arthritis caused by bony spurs in the carpal tunnel. A clinical and radiological study. J Bone Joint Surg Br. 1969 May. 51 (2):270-7. [Medline]. Ferlic DC. Rheumatoid flexor tenosynovitis and rupture. Hand Clin. 1996 Aug. 12 (3):561-72. [Medline]. Spar I. Flexor tendon ruptures in the rheumatoid hand: bilateral flexor pollicis longus rupture. Clin Orthop Relat Res. 1977. (127):186-8. [Medline]. Sivakumar B, Akhavani MA, Winlove CP, Taylor PC, Paleolog EM, Kang N. Synovial hypoxia as a cause of tendon rupture in rheumatoid arthritis. J Hand Surg Am. 2008 Jan. 33 (1):49-58. [Medline]. O'Dwyer KJ, Jefferiss CD. Scaphoid exostosis causing rupture of the flexor pollicis longus. Acta Orthop Belg. 1994. 60 (1):124-6. [Medline]. VAUGHAN-JACKSON OJ. Rupture of extensor tendons by attrition at the inferior radio-ulnar joint; report of two cases. J Bone Joint Surg Br. 1948 Aug. 30B (3):528-30. [Medline]. Walker LG. Flexor pollicis longus rupture in rheumatoid arthritis secondary to attrition on a sesamoid. J Hand Surg Am. 1993 Nov. 18 (6):990-1. [Medline]. Webb JB, Elliot D. Spontaneous rupture of the flexor pollicis longus tendon on a sesamoid bone. J Hand Surg Br. 1997 Jun. 22 (3):381-2. [Medline]. O'Dwyer KJ, Jefferiss CD. Spontaneous rupture of the flexor pollicis longus tendon: a report of three cases. Injury. 1989 Jul. 20 (4):200-2. [Medline]. Valbuena SE, Cogswell LK, Baraziol R, Valenti P. Rupture of flexor tendon following volar plate of distal radius fracture. Report of five cases. Chir Main. 2010 Apr. 29 (2):109-13. [Medline]. Casaletto JA, Machin D, Leung R, Brown DJ. Flexor pollicis longus tendon ruptures after palmar plate fixation of fractures of the distal radius. J Hand Surg Eur Vol. 2009 Aug. 34 (4):471-4. [Medline]. Adham MN, Porembski M, Adham C. Flexor tendon problems after volar plate fixation of distal radius fractures. Hand (N Y). 2009 Dec. 4 (4):406-9. [Medline]. [Full Text]. Figl M, Weninger P, Jurkowitsch J, Hofbauer M, Schauer J, Leixnering M. Unstable distal radius fractures in the elderly patient--volar fixed-angle plate osteosynthesis prevents secondary loss of reduction. J Trauma. 2010 Apr. 68 (4):992-8. [Medline]. Schneider LH, Wiltshire D. Restoration of flexor pollicis longus function by flexor digitorum superficialis transfer. J Hand Surg Am. 1983 Jan. 8 (1):98-101. [Medline]. Stahl S, Stahl S, Calif E. Failure of flexor pollicis longus repair caused by anomalous flexor pollicis longus to index flexor digitorum profundus interconnections: a case report. J Hand Surg Am. 2005 May. 30 (3):483-6. [Medline]. Mody BS. A simple clinical test to differentiate rupture of flexor pollicis longus and incomplete anterior interosseous paralysis. J Hand Surg Br. 1992 Oct. 17 (5):513-4. [Medline]. Melton JT, Murray JR, Lowdon IM. A simple clinical test of flexor pollicis longus rupture. J Hand Surg Br. 2005 Dec. 30 (6):624-5. [Medline]. Drapé JL, Tardif-Chastenet de Gery S, Silbermann-Hoffman O, Chevrot A, Houvet P, Alnot JY, et al. Closed ruptures of the flexor digitorum tendons: MRI evaluation. Skeletal Radiol. 1998 Nov. 27 (11):617-24. [Medline]. Tanaka Y, Gotani H, Yano K, Sasaki K, Hamada Y. Evaluation of flexor pollicis longus tendon attrition using color Doppler imaging after volar plate fixation for distal radius fracture. J Orthop Sci. 2017 May. 22 (3):447-452. [Medline]. Chu PJ, Lee HM, Hou YT, Hung ST, Chen JK, Shih JT. Extensor-tendons reconstruction using autogenous palmaris longus tendon grafting for rheumatoid arthritis patients. J Orthop Surg Res. 2008 Apr 24. 3:16. [Medline]. Unglaub F, Bultmann C, Reiter A, Hahn P. Two-staged reconstruction of the flexor pollicis longus tendon. J Hand Surg Br. 2006 Aug. 31 (4):432-5. [Medline]. Mannerfelt LG. 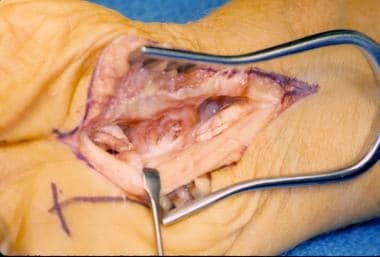 Tendon transfers in surgery of the rheumatoid hand. Hand Clin. 1988 May. 4 (2):309-16. [Medline]. Riches PL, Elherik FK, Breusch SJ. Functional and patient-reported outcome of partial wrist denervation versus the Mannerfelt wrist arthrodesis in the rheumatoid wrist. Arch Orthop Trauma Surg. 2014 Jul. 134 (7):1037-44. [Medline]. Elherik FK, Beattie N, Breusch SJ. The Mannerfelt wrist arthrodesis - a study of patient-reported outcomes in a rheumatoid population. Surgeon. 2014 Apr. 12 (2):78-81. [Medline]. Chong CW, Chen SH. Step Cut Lengthening: A Technique for Treatment of Flexor Pollicis Longus Tendon Rupture. Ann Plast Surg. 2018 Apr. 80 (4):353-355. [Medline]. Mannerfelt syndrome. Patient is unable to flex interphalangeal joint of thumb after spontaneous rupture of flexor pollicis longus tendon.